On arrival students from New Era Girl’s Senior Secondary School, Onitolo Community Senior High School, Akintan Senior Grammar School, Ideal Girl’s Senior High School and Gbaja Boys Senior Secondary School, signed in at the registration desk. The workshop started with a welcome message by Iziomoh Felix, the Executive Director, International Centre for Leadership Development Nigeria. In his remark, he introduces himself and the team members, and asks the participants to share the reason why they have to come for the training. After the welcome address, the Vice Principal of New Era Girl’s Senior School Mrs G.O Nwosu gave the opening remarks, first of all thanking the organizers for choosing to hold the event in the school and the District. She told the students that is a privilege for them to be part of the training and made them understand the reason why they are in school. She further states that we should extend the Leadership training to other Education Districts in Lagos State. Finally, she told the students to appreciate the organizer and that they should learn what they can so that people will see leadership qualities in them. James Adanigbo led the ice breaker activity, this is for students to get to know each other since they are from different schools; few students were giving the opportunity to share their experiences from the icebreaker. Segun Gbemitoji from Gbaja Boys Senior School said some people are shy to talk but he engaged them by starting the conversation. After the icebreaker activity, the first session commenced with talk from the first speaker Tlhasana Nketso from Botswana who is the Program Officer working as an Intern with International Centre for Leadership Development Nigeria. 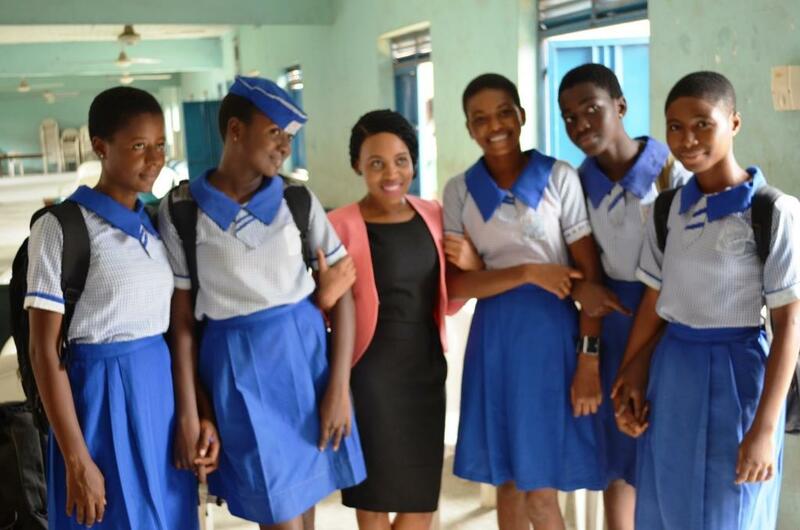 She introduced herself as a Mandela Washington Fellow of Young African Leadership Initiative (YALI) an Initiative by the United States President Barack Obama, she further encouraged the students that they can as well become a Mandela Washington Fellow when they get to the age of 18 years. They can apply for the initiative. Nketso started her session by asking the students to define Leadership in their own words, and who they think is a leader. She later asked the students to go into group of five, which is five students from different schools should make a group to identify a leader and give the qualities of the leader they identified. We had 20 groups with each group members (5) from different schools. At the end of the session, each group sent forward a representative to tell everyone who they agree to choose as a great leader and why. Nelson Mandela and Babatunde Fashola (SAN) were the most chosen by the group, they were each chosen by 6 groups. Others chosen were Goodluck Jonathan, Obafemi Awolowo, Nnamdi Azikiwe, and Barack Obama. Immediately after the group activities, she shared worksheet on leadership qualities to all students for them to identify and circle the qualities they posses. Second session facilitated by Felix Iziomoh, who presented on Goal Setting and Responsibility. He started by asking students to define goal. Different definitions were raised by the students as there was no wrong or right definition. He asked students to give examples of goals and why they set goals? Felix further gave an acronym for setting goals (S.M.A.R.T) Specific, Measurable, Attainable, Realistic and Time-bound. He continued by using examples of his personal goals which he has achieved for the students to have a better understanding of how they can make their goals SMART. The participants were provided with task to choose a partner from the same school they will like to work with, to set up a schedule to tract their progress on a particular goal with a timeline and work on the goal they would like to accomplish this year and it must be a school goal. Felix further explained to the students how they can take responsibility for themselves and what they tend to achieve in life. Mr Adedoyin made a presentation on Mentorship. He took the students through the process of understanding the importance of mentorship, who could be a good mentor and why mentorship makes their path to greatness much easier. He helped to students to understand that mentorship provides you with a possible roadmap to the future you desire if you have good mentors that have gone through a similar path and succeeded. Mentorship also makes you accountable to someone because as youths we can easily loose our focus but by having good mentors, they keep us in check as we go alone their path. The session later moved into an interaction session where some students were asked who their mentors are and why they chose those mentors. Students were asked various questions and the facilitators ask the students questions. 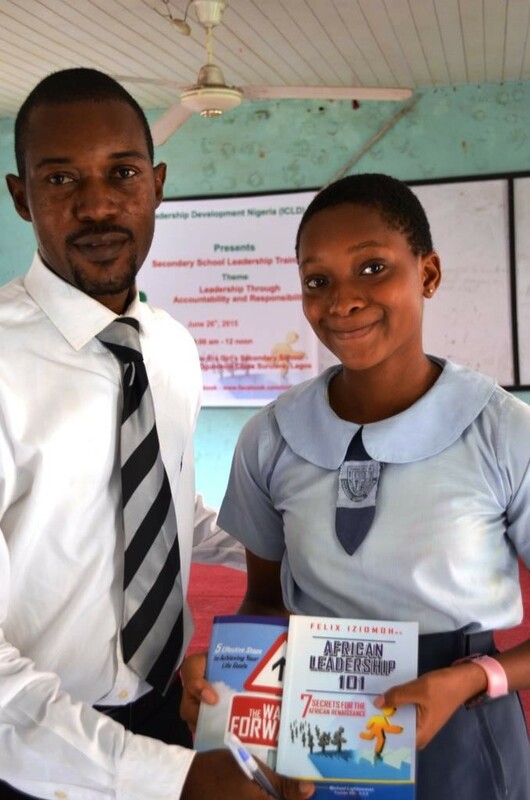 Those that answered were presented with gift of books on Leadership and Goal setting authored by Felix Iziomoh. Abidemi Balogun did the closing remarks by summarizing all that was said, encouraging the students to identify someone who they want as mentor and look for ways to reach out to the person. He also shared the benefits of mentoring and barriers of mentoring. The workshop was a success at the end as there were total of 105 students who benefitted from the program 20 students representing each school, and a teacher in attendance; we want to use this medium to appreciate Mrs Awofeso from Education District IV who was with us from the beginning of the program till the end.